At least seven people have been arrested amid 10 separate school shooting threats investigated by police across Southern California this week. Three students at three schools in Long Beach were arrested Wednesday and Thursday on suspicion of making criminal threats. A 15-year-old freshman at Millikan High School whose threats were overheard by his classmates was arrested Wednesday. A 16-year-old junior at Wilson High School who was detained by a public safety officer after being overheard making threats was also arrested Wednesday. A 14-year-old boy at Tincher Preparatory School was arrested Thursday after allegedly threatening officials. Another threat related to Long Beach Polytechnic High School Wednesday was deemed not credible. Long Beach police say there is no evidence to suggest any of the threats were related. Long Beach police Sgt. Brad Johnson told KPCC security measures are being beefed up at local schools. "Police officer presence, what we call district car checks — units going by — and we also have safe passage officers that were assigned to the high school, as well as our regular school resource officers," Johnson said. A student at John F. Kennedy High School in La Palma was arrested Thursday for allegedly making criminal threats in social media posts containing an image and text, according to police. The boy's parents have surrendered multiple firearms and were cooperating with investigators, police said. Harvard-Westlake School in Los Angeles was closed Friday following reports of a shooting threat on social media that mentioned the school by name. "Out of an abundance of caution, and because the safety of our students, faculty, and staff is our top priority, we made the decision to close school today. 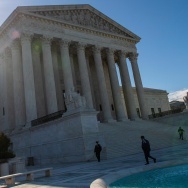 We are working closely with law enforcement and will share more information when we are able." In Norco, Riverside sheriff's deputies arrested resident Jacob Ryan McBain, 27, after investigating a report Monday of a person posting comments on his Facebook page that indicated he intended to shoot people at a local college campus. No specific school was mentioned, but authorities notified local college and district officials. Deputies searching McBain's bedroom recovered an AR-15 and two handguns, all loaded, along with a large amount of ammunition, according to the Riverside County Sheriff's Department. McBain was arrested on charges of making terrorist threats and being a felon in possession of a firearm. 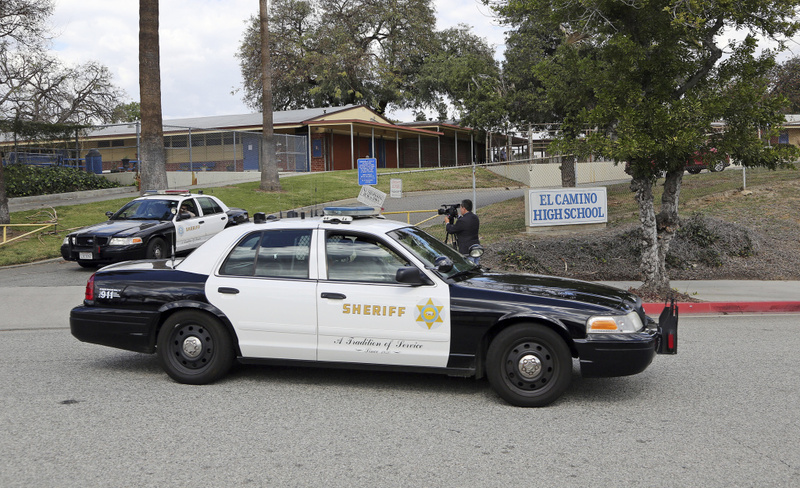 Los Angeles County Sheriff's patrol cars leave El Camino High School in Whittier, Calif., Wednesday, Feb. 21, 2018. In Whittier, police arrested a teen and his adult brother after a security officer at El Camino High School said he overheard the student making threats last Friday. An investigation by the Los Angeles Sheriff's Department uncovered two assault rifles and nearly 100 high-capacity magazines at the student's home. The 17-year-old student said his comment was a joke. 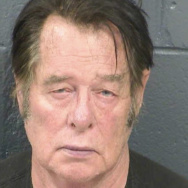 He was arrested on suspicion of making a criminal threat. The teen's 28-year-old brother, Daniel Eriberto Barcenas, was also arrested and faces charges of possession of an assault weapon, importing a high-capacity magazine and other violations. One of the rifles was unregistered, which is a felony in California, according to Sheriff Jim McDonnell. In Lancaster, sheriff's deputies were investigating a threat made by a student at Quartz Hill High School. Sheriff's officials said a student on Wednesday evening made a verbal threat of violence that was to take place at the school on Thursday. The student was not considered a threat and had already been taken to the hospital "by another county agency on an unrelated incident," according to a statement from the L.A. County Sheriff's Department. Deputies were still investigating a video, reportedly made by a parent, that has been circulating social media sites. Meanwhile, the Los Angeles Times reports that Inglewood police detained a person behind a social media post they became aware of Monday that indicated "students attending a specific Inglewood school were at risk of being targeted by a shooter," according to a news release. Police have discussed possible criminal charges with the L.A. County district attorney's office, the Times added. A student wears a Valentine's pin as she leaves Marjory Stoneman Douglas High School in Parkland, Florida, a city about 50 miles north of Miami on Feb. 14, 2018 following a school shooting. A national uptick after Florida? 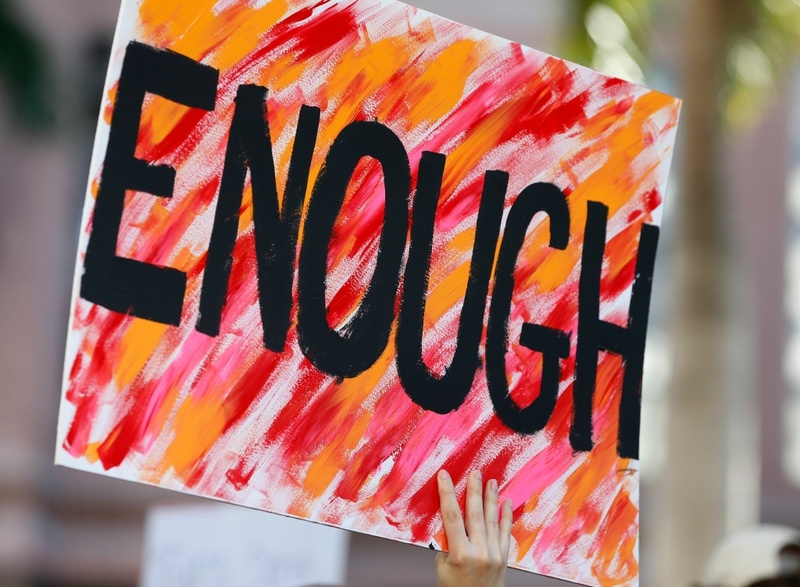 Since last week's school shooting in Parkland, Florida, the number of threats of violence against schools appears to have increased nationally and not just in Southern California. Educators School Safety Network says it recorded about 50 threats a day on average since the shooting at Marjory Stoneman Douglas High School, where 17 people died. 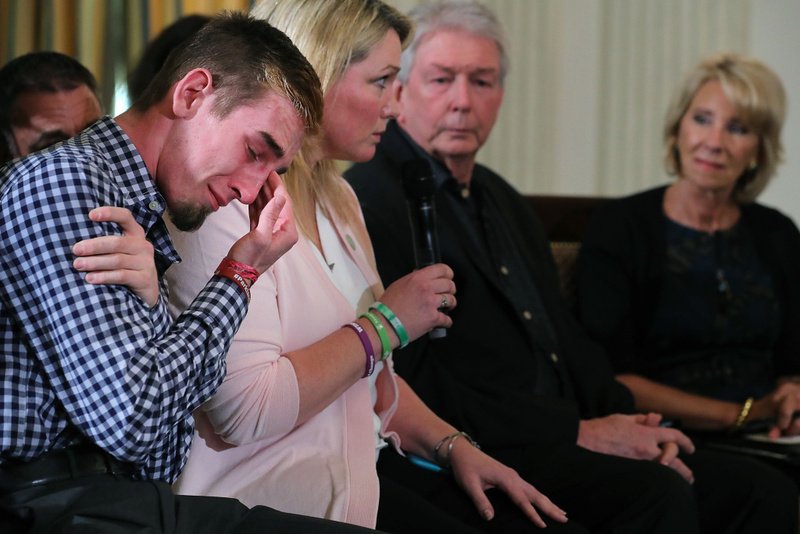 Marjory Stoneman Douglas High School senior Samuel Zeif weeps after talking about how his best friend was killed during last week's mass shooting while he participates in a listening session hosted by U.S. President Donald Trump on February 21, 2018 in Washington, DC. In St. Mary's County, Maryland, two teenage boys are facing charges for allegedly making threats of mass violence. Dozens of weapons, including semi-automatic rifles, handguns and ammunition, were recovered from the home of one of the suspects. A Montana high school student was charged Tuesday with intimidation and assault with a weapon over numerous threats to "shoot up the school ." Court records say the 18-year-old told investigators he was joking and regretted frightening students. 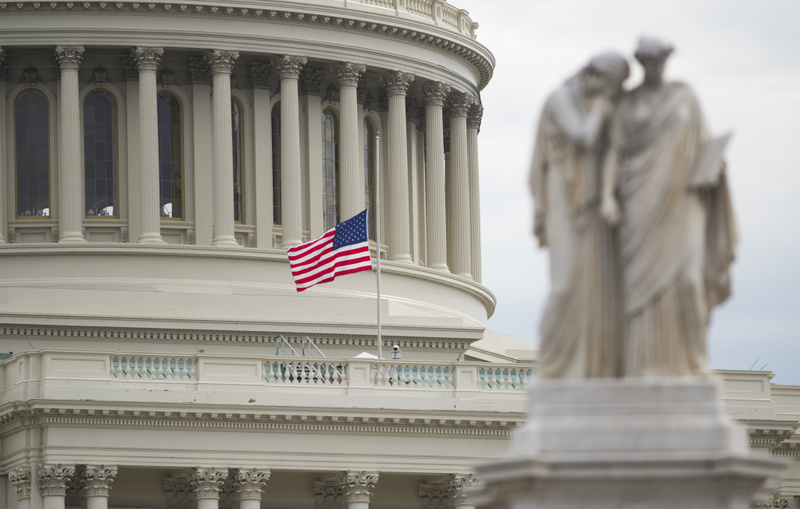 An American flag flies at half staff over the U.S. Capitol in Washington, DC, February 15, 2018, following a school shooting in Florida the day before.